The new APS-2000 is a superior, impact-style trailer restraint that was developed specifically to reduce the occurrence of accidents at the dock. The new APS-2000 combines an advanced communication system with a low profile restraint carriage. It also has an impact extension bar that accommodates a wide range of lower rear impact guards. 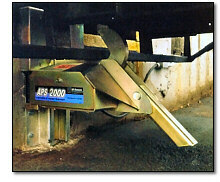 The low maintenance APS-2000 is a significant improvement to a light system or manual wheel chocks. The APS-2000 is durable and low in maintenance.